An Air Oasis air purifier uses UV light to clean the air in a room. This type of air purifier does not use a filter. This is a big advantage of these types of machines. You never need to buy another replacement filter. This saves $100s of dollars a year. Is this an effective way to clean the air? Does it really work as advertised? An Air Oasis air purifier uses PCO (Photocatalytic Oxidation) Technology to clean the air in your room. PCO air purifiers use UV light to remove air impurities. These purifiers are based on what Air Oasis calls an AHPCO (Advanced Hydrated Photocatalytic Oxidation) Cell. This cell is a broad spectrum UV light in a hydrated catalytic cell. There are 5 different metal catalysts. Ozone is also produced. The company claims most of the ozone is converted into these other ions. These air purifiers are rated at releasing only 1 part per billion of ozone. This is below the FDA standard of 5 parts per billion. The ions produced by the AHPCO Cell are released into the air. The float around and react with the pollutants in the air. The chemical reaction removes the pollutants from the air. This type of filter doesn't have a fan. It is based on producing ions that can travel throughout your house. It treats all the air in the house without having to push it through a filter. It also claims to sanitize surfaces in your house in addition to just the air. These are some features common to all Air Oasis air purifiers. We looked at three different Air Oasis air purifiers. This covers an area of 500 square feet. It is 3" X 3" X 12" and weighs 3.5 pounds. This covers an area of 1000 square feet. It is 4" X 4" X 13.5" and weighs 3.5 pounds. This covers an area of 3000 square feet. It is 4" X 4" X 14.5" and weighs 3.75 pounds. 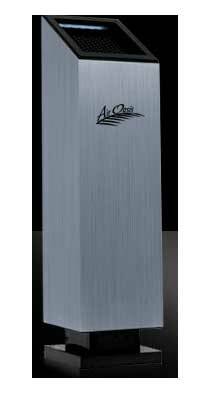 All Air Oasis air purifiers make a note that if you floor plan is closed, you may need to get additional units. The ions produced by this machine cannot go through walls. These come with a 3 year limited warranty for parts and labor. A 1 year warranty on the AHPCO Cell. Well that is the big question, isn't it? Let's take it step by step. What can a UV light do? UV light alone can kill germs, bacteria, and other biological organisms. In order to kill them they have to be directly in the UV light. They also have to spend some time being exposed to the UV light. If a fan in a purifier pushes the air through too fast, it doesn't have time to kill germs. If it goes too slowly, it doesn't move enough air to effectively clean the room. Air Oasis air purifiers have a weak fan. The fans only move 13 - 15 cubic feet of air a minute. Let's take a 10 by 12 foot room with 8 foot ceilings. That is 960 cubic feet of air. This fan will almost give you one air exchange a hour. So this air purifier will kill the germs that pass through it. The idea behind this system is the UV light causes a reaction in certain medals. This reaction creates certain ions: hydro peroxides, hydroxide ions, super oxide ions, ozonide ions. These ions can then travel through the air cleaning it. They react with the bad things in the air removing them. Does it work? The science behind this is fine. If these ions come into contact with bacteria, VOCs, chemicals, etc in the air, they will remove them. We don't think that they are as good as they are advertised. Especially, without a fan to move them, they coudl have a hard time moving through your house. We know that UV light can be a great santizer. It can kill most living things exposed to it. Photocatalytic Oxidation works in theory. We know that these ions will remove gases, chemicals, and VOCs from the air. We don't think that these ions spread as far as the manufacturers would have us believe. We think that this air purifier will work well on odors, VOCs, and bacteria. Their own website warns that this unit will not remove particles from the air. We wish they would combine this technology with an efficient HEPA filtering system. We like use UV light as part of the air purifier. We believe that you need a filter in order to remove particles from the air. We always recommend an air purifier that uses a HEPA filter. In short we would recommend this product if your main concerns are VOCs, chemicals, biological contamination, gases, or mold. For other filtering needs we think you would be better off with a HEPA filter. If you are buying an air purifier to help with asthma or allergies, we recommend you look into something different like an Austin Air purifier.